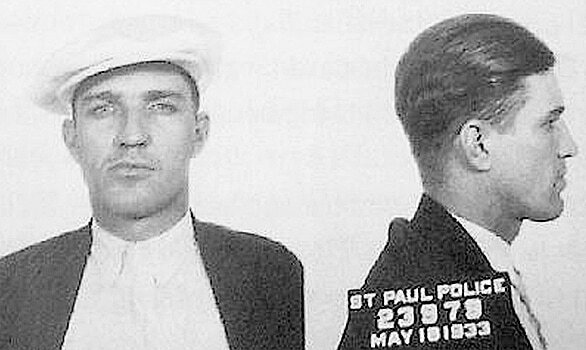 Tommy Carroll following his 1933 arrest in St. Paul. Thomas Leonard “Tommy” Carroll was not your average bank robber. Unlike many in his profession, he didn't set out to be a high profile criminal, but like so many others, gradually worked his way into it. A veteran of World War I, Carroll was a professional boxer who supplemented his income with crime. His first confirmed arrest came on Jan. 20, 1920, when he was held for 60 days in Nebraska’s Douglas County jail “for investigation.” He was released without charge, and that set a pattern of arrest/release over the next decade. On Oct. 24, 1921, he was arrested in Council Bluffs, Iowa, this time on a larceny charge. Convicted on Feb. 7, 1922, he was sentenced to five years at the Anamosa State Reformatory in Anamosa, but was paroled in March of 1923, just over a year after his conviction. He continued to have run-ins with the law during the next few years, but managed to avoid any meaningful jail time. He was charged twice with robbery, once in Kansas City, Mo., on Nov. 21, 1924, and again in St. Louis on Aug. 11, 1925, but both cases were dropped. The following year, on Aug. 28, 1926, he was back in a St. Louis jail on an auto theft charge, but again was released without conviction. Just a month later, on Sept. 15, he was arrested in Tulsa, Okla., on a concealed weapon charge. He was released with a day or two, but was immediately turned over to St. Joseph, Mo., where he was charged with a Sept. 26, 1924, bank robbery. He was held for trial and on Jan. 11, 1927, Carroll was acquitted and released. He was back on the streets, but his luck was running out. Within weeks he was arrested yet again, this time for an armed robbery in Missouri. On. April 1, 1927, he was found guilty and sentenced to five years in the state prison at Jefferson City, the same prison where John Dillinger, Harry Pierpont, Charles Makley, Homer Van Meter, Russell Clark, John Hamilton and others he would eventually work with were already being held. Within a few years, all these men would be among the most wanted men in America, and in less than eight years all except Clark would be dead at the hands of police. Carroll served about two years in Jefferson City and was paroled, only to be rearrested just weeks later, this time charged with violation of the 1919’s Dyer Act. Also known as the National Motor Vehicle Theft Act, the law made transportation of a stolen vehicle across state lines a federal crime. Tried and convicted, Carroll spent 21 months in Leavenworth before being paroled in October of 1931. He managed to avoid additional arrests for about 18 months, but on May 17, 1933, Carroll was picked up in St. Paul and charged with possession of burglar tools ... but again charges were dropped and he was released. It was about this time he came into contact with George "Baby Face" Nelson. A Chicago native, Nelson had recently returned from the West Coast where he had worked for the Syndicate. Now, he was attempting to put together a gang for a series of bank robberies he was planning. Carroll was about to step out of the shadows and into the big time.